In July this year District 1130 London had donated a large quantity of blankets and other items for Quantas Airlines to be distributed to worthwhile causes. 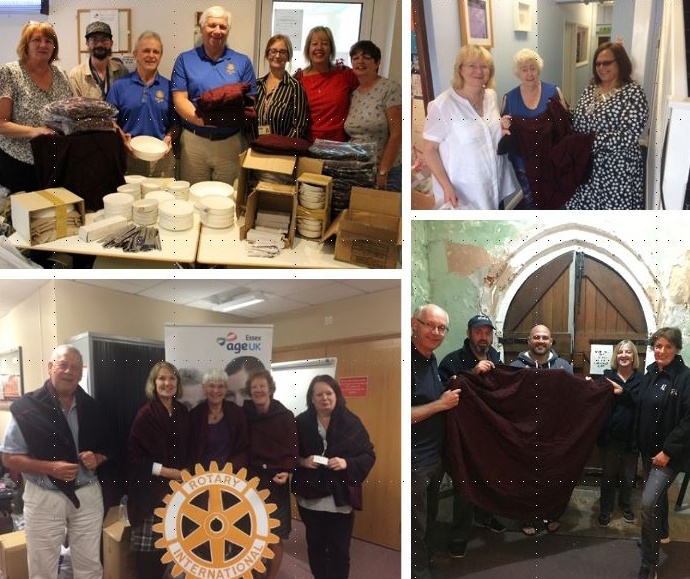 District 1240 Community and Vocational Service Chair received 1000 of the blankets to be donated across the Essex and Herts region and we were able to support a number of different charities. Rotary Club of Harlow supporting Streets2Homes is a charity based in Harlow, Essex and we manage a day centre which seeks to reach out to and help homeless people. Rotary Club of Rayleigh Mill supporting HARP Southend whose mission is to reduce homelessness in Southend-on-Sea by providing emergency housing and long-term solutions that enable people to rebuild their lives and live independently in the community. Rotary Club of Hadleigh Castle supporting Yellow Door Project who are Making a difference to Young Peoples lives. The Rotary Club of Sawbridgeworth supporting Michael Roberts Trust which is a Christian-based charity whose aims and objectives are to develop voluntary work and social opportunities for people who are often perceived as being disadvantaged, either through a disability or social difficulty. The Community and Vocational Team across our Rotary Clubs are always pleased to receive donations that can be distributed to worthy causes especially at this time of year when we are moving into the cold weather and Christmas. If you are a business and what to donate to Rotary across Essex and Herts please get in Touch so that we and your business can make a difference to our communities.